The Guardian Dukeis award-winning novelist Jamie Carie's most exciting story yet, a uniquely arranged Regency-era romantic adventure where hero and heroine know each other through written letters but have yet to meet. Gabriel, the Duke of St. Easton, is ordered by the King to take guardianship over Lady Alexandria Featherstone whose parents are presumed dead after failing to return from a high profile treasure hunt. But Alexandria ignores this royal reassignment, believing her parents are still alive and duly following clues that may lead to their whereabouts. Gabriel, pressured by what are actually the King's ulterior motives, pursues her across windswept England and the rolling green hills of Ireland but is always one step behind. "Get lost in Ireland in this rollicking adventure with a brave, headstrong heroine and a relentless yet honorable duke determined to save her from a dangerous quest. With rich characterization and an intriguing plot, Jamie Carie'sThe Guardian Dukewill leave you breathless for the next installment!" 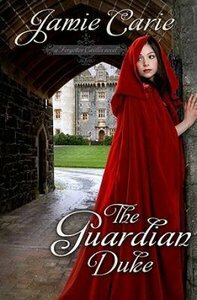 About "The Guardian Duke (#01 in Forgotten Castles Series)"
Jamie Carie ranked first among the top unpublished writers of 2006 at popular arts and entertainment Web site Infuze. An insatiable reader herself, Jamie's influences range from Dickens and Dumas to Francine Rivers and Nicholas Sparks. She lives with her husband and their three children in Indianapolis, Indiana. She has authored Snow Angel her first romantic novel.